I get asked this question a lot… so I am going to provide an explanation of what Brain-Based teaching is, as well as clear up any myths or misconceptions about it. Brain-Based education is the active engagement of practical strategies based on learning and behavioral principles derived from neuroscience. All teachers use strategies; the difference here is that you’re using strategies based on real science, not because someone said that they work. An example of a principle would be…”Brains change based on experience.” The science tells us HOW they change in response to experience. The strategies are based on what we’ve learned from studies on how brains change. Questions are often raised about the reliability of brain research for training or classroom applications. Cautious, conservative skeptics will, by nature, be hesitant to embrace new things. Overzealous or impulsive risk-takers will, by nature, try almost anything, founded or not. A better-informed educator usually makes better decisions. We collect the research, form conclusions and make suggestions. Every effort is made to select from reliable sources with supporting data. If the studies are conflicting, we’ll either say so or not present it to you. You’ll need to be the ultimate judge as to whether and how the research fits in your particular learning climate. One must be cautious and prudent in how research is interpreted and ultimately used. Our policy is to look for both the basic neuroscience research and match it with data from applied psychology or cognitive science. When there are multiple studies, with good samples and clear evidence, you’ll hear about it. We will never say, “Brain research proves….” because it does not prove anything. It may however suggest the value of a particular pathway. We have heard five basic criticisms about brain-based education. Here’s what they are and our answers to them. RESPONSE: This criticism is genuine. Many well-meaning educators have gone way beyond the research and said that it “proves” that a “certain” classroom strategy is justified. We often hear educators making claims that have no basis in research. Educators who are going to use or quote research ought to know what makes a good study, who is funding it, the reputation of the researcher, the design of the study, what are the implications and constraints on the findings. A little information can be dangerous. To be accepted as professionals, educators must know their stuff. We assert that brain research proves nothing. There is no body of brain-based research that justifies every strategy of so-called “good teaching.” In fact, most of what passes for good teaching is a collection of folk wisdom, basic psychology and common sense refined by trial and error. However, new findings can steer all of us in more productive directions. This approach, which is cautionary and not causal, sticks with the truth. First, that there are valuable, new studies and second, that given the insight of those studies, certain actions seem to make good sense. We do not claim that “brain-based” is or should be the only criteria for deciding what to do. It’s a bad idea to base a school on biology alone. However, if schools ignore it, they are being equally reckless. RESPONSE: When people say “good teachers have been doing this for years,” two things are true. First, you may be very young or have a short memory. Only 40 years ago, good teaching was defined by all-lecture, content-laden classes, clean desks, quiet students (in their seats), with little movement. Yes, it’s true that some teachers have been using brain-compatible strategies for centuries, but most have been moving towards a more brain-friendly approach. Keep in mind that if you don’t know why you do what you do, it’s less purposeful and less professional. It’s probably your collected, refined wisdom. Nothing wrong with that, but some of the “collected, refined wisdom” has led to some bad teaching, too. But to be purposeful about your work; ah… that is another matter. Are there recent discoveries from the world of brain-mind science that can be applied to the classroom? You bet! Here’s a list highlighting a few specific areas of research that have important implications for learning, memory, schools and trainings. As you can tell, these discoveries come from many areas. Critics who worry over where the research comes from are missing the point. Educators need to, and ought to, combine the findings of the brain/mind field with other fields to diversify and strengthen the applications. Neuroscience is not the only source for research; it’s an important part of a larger puzzle. When you synthesize it with other fields like sociology, chemistry, anthropology, future studies, anthropology, therapy and others, you can get some powerful applications. Cognitive science, psychology, neurobiology, and neuroscience are all studying the same thing! They are interested in the brain/mind and how it works. The brain is what you have, the mind is using it. Different fields do research at different levels. Basic neuroscience research is usually done at the molecular, genetic or cellular level. At this level, we hear of neurogenesis and the growth of stem cells. That’s contrasted with applied cognitive sciences, which may feature animal studies, or clinical studies that show the real world behaviors we are equally interested in. The point is, we now know enough about the brain to justify specific strategies that only a few years ago were just good ideas without scientific basis. Here’s an example. We have irrefutable evidence that embedding intense emotions (like a celebration or drama) into an activity may stimulate the release of adrenaline, which may encode the memory of the learning much stronger. RESPONSE: I agree. There needs to be better sharing and networking so that all of us are on “the same page.” Many ill-informed educators are still confused about some learning basics. Here is a summary of some of the myths and realities. MYTH: Early childhood experiences cause our synaptic count to multiply rapidly. REALITY: If anything, we lose synapses through a “pruning” process in the first five years. MYTH: Low stress learning is best. REALITY: In general, moderate levels optimize learning. Under some conditions, low stress is better, and in others, higher stress is better. MYTH: Research proves the critical need to capitalize on the early windows of opportunity. REALITY: Normal childhood experiences usually produce normal kids. The most critical windows are those for our senses, the parent-infant emotional attunement, language learning and a non-distressed sense of safety. Those are irretrievable time slots in our lives–once they pass, it’s too late. Other opportunities, like social skills, reading, music and language have a much longer window of opportunity. MYTH: Rote memorization is brain-antagonistic. REALITY: The brain strengthens learning through repetition. It’s not repetition that’s bad; it’s when it becomes too boring. There are many creative and fun ways to review. MYTH: Environments primarily determine learner success. REALITY: Many factors influence learner success including parents, peers, genes, trauma, nutrition and environment. There is no way to quantify them and say one of them is more important than another. 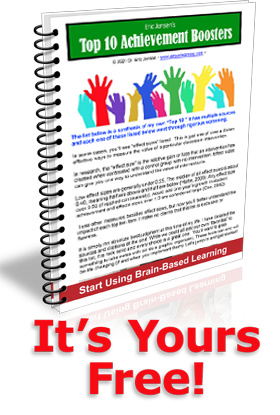 MYTH: Most learners use only 5-10% of the brain. REALITY: There is no objective evidence that this is true. On a daily basis we probably use most areas of our brain. Increases in creativity or productivity can come from doing the right thing, or doing it more often, rather than simply doing more. MYTH: Emotions and intelligence are separate. REALITY: While they may originate in separate places in the brain, their paths usually cross in the orbitofrontal cortex. So, in a sense, they are inseparable. MYTH: Mozart is the best music for enhancing learning. REALITY: Recent studies show many kinds of music can work as well as, or better, than Mozart. One of Mozart’s compositions (K.448) has shown a modest enhancement in spatial-temporal learning. MYTH: Learning Styles and Multiple intelligences are brain-based. REALITY: These make good sense based on what we know about the brain. They address the uniqueness of the human brain. But both were developed before our current understanding of the brain and have stronger roots in psychology and social science than neurology. MYTH: The adult brain cannot grow new cells. REALITY: Studies have demonstrated that the human brain can and does grow new cells in the hippocampus. Just as importantly, the cells do take on functional roles and interact with existing cells. MYTH: Getting the right answer quickly is best. REALITY: Given the value of trial and error learning, probably those who are not the quickest (and not the slowest) are more likely to be better, more reflective thinkers. MYTH: An enriched environment is one with posters, mobiles, manipulatives & music. REALITY: Enrichment occurs more because of the process that the learners are undergoing. You need a prevailing contrast from the “baseline” environment. If a kids watches TV all day, going out to play is enrichment. Challenge, feedback, novelty, coherence and time are crucial ingredients for re-wiring the brain. Enrichment means heavier cells, greater dendritic branching, more glial cells, multiple synaptic junctions and, in some cases, new cell growth (in the hippocampus). MYTH: More focused classroom attention by students on the teacher improves learning. REALITY: Students need time to digest, think, reflect and act on their learning for connections to strengthen. MYTH: More content per hour is better. REALITY: Each subject and each learner probably have an ideal amount of ”ideas per hour” that can be learned based on learner background, motivation, learning skills and subject complexity and novelty. Only language acquisition occurs better with more content per hour. MYTH: The left brain is logical. REALITY: The left hemisphere is better with sequencing, language, parts and creating internal dialogues (interpreting events). Any logic produced is not a structure=function relationship result. MYTH: We now know how to best assess learning. REALITY: Much of what we learn we still don’t know how to assess. Examples include volition, subject affinity and the development of mental models. MYTH: More synapses formed means greater intelligence. REALITY: There is no evidence that this is true. MYTH: All can learn and meet high standards. REALITY: This is true only for those who have healthy brains. Add up all the students with some kind of brain dysfunction problems (depression, brain insults, ADD, drug usage, dyslexia, OCD, distress, alcohol, trauma, etc.) and you’ll have from 40-60% of your school population, depending on the school. Healthy brains make for good learners who can reach high standards. Students with unhealthy brains commonly have learning problems. Can they be reached? Most of them, yes, if there are sufficient resources. Others may never reach their potential. MYTH: The right brain is creative. REALITY: The right brain processes spatial information, works randomly and with wholes (the gestalt). None of these attributes guarantee creativity. There are very clear, anatomical and functional differences between the left brain and right brain. But how much value there is in applying that knowledge is questionable. I’ll cite just one example to show you why I disagree. The reading improvement product FastForword, was developed by two neuroscientists, Stanford’s Dr. Michael Merzenich and Dr. Paula Tallal from Rutgers. That product is already in use today in thousands of classrooms around the country. Many students have been helped by it. It specifically uses discoveries in neural plasticity to change the brain’s ability to read the printed word. The fact is, the benefits are already reaching the classroom. And they’re not just through thousands of books and in-services. Schools should not be run based solely on the biology of the brain. However, to ignore what we do know about the brain would be equally irresponsible. Brain-based education offers some direction for educators who want more purposeful, informed teaching. It offers the possibility of less hit or miss in the classroom. We have learned about how environments impact our learning, the role of trauma and the effects of distress and threat. With additional clarity in research, brain-based approaches may soon suggest far better options for those struggling with learning. Yes, we are in the infancy of brain research–there’s so much more to learn that we don’t know. But dismissing it as fad-like, premature or opportunistic is not only shortsighted, but also probably dangerous to our learners. Of course brain research seems conflicting, hazy, confusing, and contradictory. It’s new! That should be expected! But to criticize it? At this early stage, that would be like calling the first dim lightbulb by Thomas Edison a failure because it only was a 10 watt bulb and produced minimal brightness. The future belongs to those with vision who can grasp not just trends, but the importance of them. Nothing is more relevant to you than your brain or the brain of your spouse, parents, or children. We might as well get used to it. Integrating brain research with our every day lives is here to stay. Nicely and correctly stated Eric! I’ve avoided the use of the terms brain-based and brain-compatible because they carry so much negative baggage from the early days of inappropriately speculative claims. I have learned so much from your books and newsletters! (Hopefully, I can get to a conference one of these days! )The brain is so complex and fascinating – I appreciate the fact that you keep up with the current research and put it in understandable terms. I have been a teacher most of my life and this ‘just makes sense’ to me in understanding my students and how they learn. I attended one of your conferences in San Fransisco in 2008, and I have been obsessed with brain functions, learning, and teaching, ever since. Thank you for developing your program to inform educators. Thank you Eric for your Newsletters. It is very useful for me when I don’t understand or misunderstand about the brain I can get the answers from your writing. Rigth now I have an innovation call “Happy Learning” using in the schools I am in charge. Thank you so much for this article. I am a Teacher for the Deaf and Hard-of-Hearing. Since this is the field of education that I have chosen, I am very much interested in how the brain works. Do you have or know of any articles about how the “deaf” brain thinks and learns? I have been able to locate a few but am always searching for more. Information of this type, I believe, helps me to be a better teacher. Sharing this information can help to develop a better educational field for all. I know it can certainly eliminate some biased opinions and misconceptions in the general educational population. Hey Stanley,Great sammury there. Many thanks for the pointers to things I’ve yet to see. Imagine a paragraph about teaching and learning, but without the word and concept of teacher/ing. I think by calling it teaching is dead, long live learning I meant to point out that learning occurs without teaching. Basically reinforce Illich’s and many other’s who say that most if not all of our learning does or can occur outside institutionalised learning (teaching). Many people talk about the need for teachers to become learners again, in readiness for this new age. The day teachers stop being learners, is the day they can no longer be teachers. So what good is the concept of teaching? Is it not enough to simply work with the idea of learning? Or more importantly, what do we loose by ceasing to use the word teacher?